This whole expedition was Workman’s idea. In 2002, she enlisted two Joint Program colleagues, Standish and Margaret Boettcher, to join her research project on the Samoan island of Ta’u. 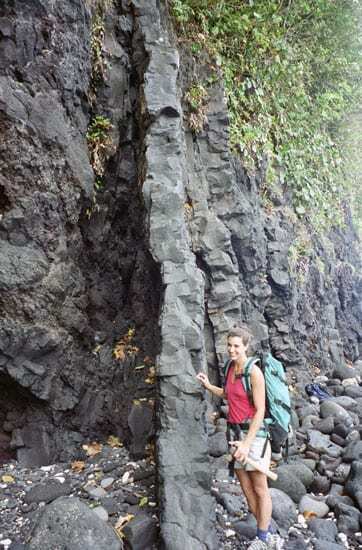 It was an extra project she had decided to take on—a side venture to her main research of exploring chemical clues in rocks to reveal how volcanic island chains form. This wasn’t the first time that Workman interrupted her studies for a volcano. As an undergraduate, she volunteered to work for a semester at the Hawaiian Volcano Observatory atop the highly active volcano of Kilauea, home of Pele, the Hawaiian goddess of volcanoes. The Earth moved under her feet. But that’s not unusual around active volcanoes. Within a volcano’s underlying magma chamber, magma or gas continually surges or subsides, inflating or deflating the volcano’s surface and deforming it in the process. These deformations are usually tiny, but they can be measured to evaluate what’s going on inside the volcano and to predict whether it might erupt. Workman was a member of the Observatory’s deformation research team. After Workman came to WHOI, first in its Summer Student Fellowship Program, then as a graduate student, her research led her to Ta’u. Like Hawaii, Ta’u is the youngest and most volcanically active island in its chain. Only 7 by 4 kilometers wide, Ta’u’s central volcano rises skyward. It was formerly dome-shaped, but one of its sides collapsed in landslides that cast debris all the way onto the seafloor. 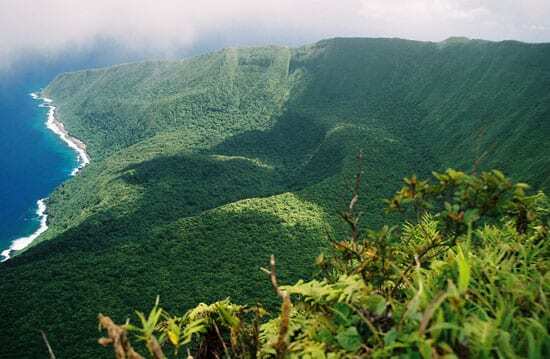 The landslides left a steep escarpment, which is primed for further catastrophic landslides—and possibly tsunamis—especially if it is disturbed by movements within the volcano. Workman’s idea was to assess Ta’u’s volcano and landslide hazard potential by measuring its subtle motions with Global Positioning Satellite receivers that can measure ground-motion changes as small as 1 centimeter. Like most ideas, this one required funding. Workman applied for a grant from a WHOI fund that seemed tailor-made: the Robert H. Cole Endowed Ocean Ventures Fund for special student projects. With OVF funding, Workman organized the expedition, conscripting the GPS equipment, as well as Standish and Boettcher. 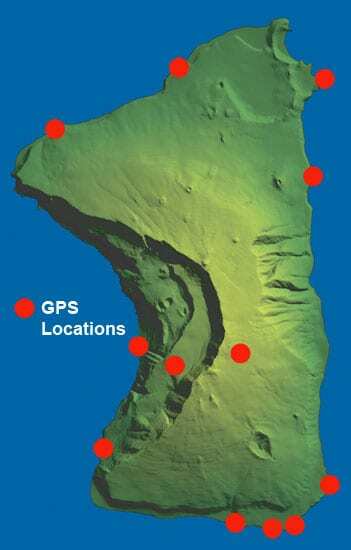 They installed GPS benchmarks throughout the island and took GPS measurements at them. That required a few machete-in-hand forays into the untrammeled interior, along the precarious escarpment, and to the top of the mountain. “The experience of fieldwork is irreplaceable,” Workman said. “You’ve got the rocks under your feet. You’re concentrating on the landscape and developing an intuition that I don’t think you can get any other way. You start to understand the landscapes and the volcanic processes just by being there and seeing how things look. “And you’ve planned the whole thing and learned how to work with colleagues to get it done,” she said. In the summer of 2004, Workman returned with JP student Matt Jackson to re-measure the benchmark locations. After her return, Workman scrambled to complete her Ph.D. dissertation in March. Now, she will analyze and compare her GPS measurements to detect telltale ground motion on Ta’u. 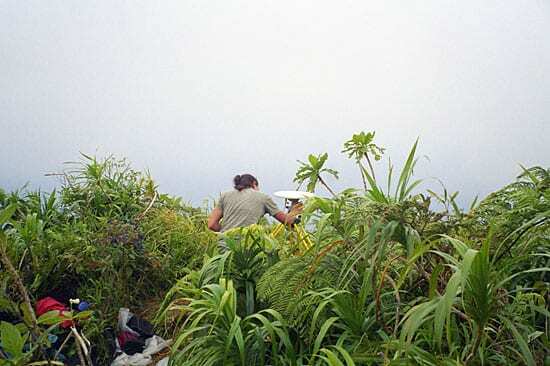 STUDENT EXPEDITION LEADER—Rhea Workman, a MIT/WHOI Joint Program graduate student, organized expeditions in 2002 and 2004 to assess the volcano and landslide hazard potential on the Samoan island of Ta'u. Here she stands near a lava dike formation on the island.